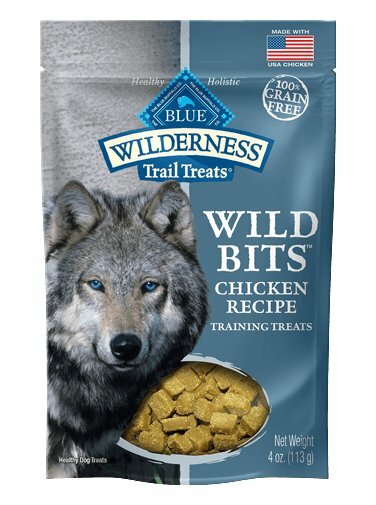 A perfect complement to the Wilderness foods, BLUE Wild Bits treats are packed with more of the real chicken your dog loves. A healthy, nutritious treat that features real meat, these meaty Bits are the perfect way to reward your four-legged friends. BLUE Wild Bits contain NO artificial flavors, colors or preservatives so you can reward good behavior with a treat that's made the way nature intended. Deboned Chicken, Potatoes, Chickpeas, Maple Syrup, Vegetable Glycerin, Gelatin, Salt, Flaxseed (source of Omega 3 & 6 Fatty Acids), Natural Smoke Flavor, Fish Oil (source of DHA-Docosahexaenoic Acid), preserved with Phosphoric Acid, Sorbic Acid, Citric Acid and Mixed Tocopherols, Oil of Rosemary.